From 2007 – 2012 I worked for a travel wholesale company as a Business Development Manager. One of the things we represented was the Tourism Authority of Thailand, and our role was to promote Thailand and to host regular familiarisation trips for New Zealand travel agents. I was lucky enough to host a number of these trips to Thailand and it is a country that I really love. Most people will arrive in Thailand in the capital city of Bangkok. It is well worth sticking around and spending a few days in this fascinating city. The airport is located quite some distance from the city centre, but the train takes you straight in to the city centre, and from there you can hop in a taxi to get to your hotel. Getting around the city you can take the sky train, the water taxis on the river and also travel by Tuk Tuk! You can’t visit Bangkok and not go in a Tuk Tuk. Check with your hotel to get an idea of how much you should pay for the fare – it is ok to negotiate. Some Tuk Tuk drivers seem to think that instead of taking you to your destination, that you should really visit their tailor friends shop instead – this is inconvenient, but I have never felt unsafe and you can usually carry on to your destination without any trouble! There is plenty to see outside of Bangkok, and so many different destinations to go to. Chiang Mai in the North is really interesting. You can visit the hill tribes and go trekking through the jungle on elephants. South of Chiang Mai is Kanchanaburi – or you might recognise it from the movie – Bridge on the River Kwai. This is one of my favourite places in Thailand. It is beautiful and has a tragic history. You can stay in luxury tents or in a very basic but absolutely gorgeous floating raft on the river Kwai – take the bike in the morning to give an offering to the Buddhist Monks. Further South, you can visit a place called Pattaya. This has huge hotels and conference facilities, it is busy and has great night life. If you visit you must go to Tiffany’s Show – it is a cabaret production with the most stunningly gorgeous ‘Lady Boy’s’ (everyone keeps their clothes on in this show!) and the costumes are spectacular! Heading south again the coastline is full of fabulous resort towns set on gorgeous beaches. There is something for everyone, if you want to stay in anything from a hut on the beach for a couple of dollars a night, through to a relaxed boutique hotel in a quiet place, or a huge resort near a town with nightlife, markets and shopping – there is something to suit every taste and budget. Most areas have got temples – which are gorgeous and well worth a visit. Take a tour with a guide to explain the temples and customs and it will be even more interesting. Most tourist areas also have elephant trekking. Some of the elephant companies are nicer than others, so do some research before you go. Riding an elephant is a bit uncomfortable! But it is fun with a nice operator. It is polite to tip your elephant driver a couple of dollars. You can also have a fabulous Thai massage – either relaxing or where they click every joint in your body and walk up and down your back! You can get great clothes made at a tailor – excellent prices, and they only take a couple of days to make a dress or a suit – take photos of what you want before you go along, or a favourite item for them to copy. Shopping in the markets is lots of fun – make sure you barter! You can even have little fish nibble the dead skin off your feet at the fish spa… Eating from the street vendors is also a great experience for the adventurous. Fresh products cooked in front of you and served hot – I have never had anyone on any of my trips get sick. Also don’t drink the water from the tap – even to brush your teeth… It is also fun to go to a Thai Kickboxing competition. Sometimes there are huge ticketed events, and others are practice events. Either way they love kick boxing in Thailand and it is really entertaining. The Islands are gorgeous. On the West Coast is Phuket with Phi Phi Island in between Phuket and the mainland. 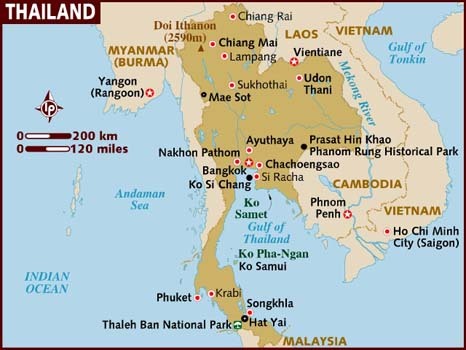 On the East Coast in the Gulf of Thailand are the islands of Koh Samui, Koh Tao, Koh Chang and many more. The Islands are lovely and I can’t wait to come back and sail around these areas! There are so many different places to stay, and you can take day trips out to snorkelling sites – however don’t expect to have the place to your self! Phi Phi Island for example – when we arrived we were the only boat there, and then thousands of people arrived! It was unbelievable! The water is clear and there are lots of fish, but I was always disappointed with the amount of rubbish in the water and on the beach. You can either do a day trip in a huge boat – with LOTS of people on board, or a smaller big speed boat – with about 20 people, or you can charter your own long tail boat. Whilst travelling in a long tail is quite fun, I personally would recommend one of the big speedboats. They have about 4 engines, so hopefully a better chance of getting you back, and sometimes the water can get quite rough! One of my most favourite places I visited in Thailand is a place called Elephant Hills. This is a luxury tented camp in the heart of the rainforest. They also have a floating camp on a lake in a National Park. It is absolutely stunning and I have sent many people back to stay there. Instead of riding the elephants, you get to feed and wash them, which is just fabulous. You also get to raft down a river, travel around the lake on a long tail boat, go walking in the jungle and kayaking around looking at wildlife. This is a really special place. Hosting groups was always interesting. I would usually host 8-12 people on each trip. We would also have a local guide and a driver. Travel agents are usually lots of fun, however in every group there is ALWAYS one person who is a problem… You can usually tell who ‘the one’ is as they are walking up to you at the airport! This person will be the one who loses their luggage, leaves their passport in the hotel safe, falls over and injures themselves, is too fat to do the day trips or get in and out of the boat, is afraid of leeches so won’t go on any of the boat trips, doesn’t like spicy food, turns up to do hotel inspections wearing their swimsuit and a T shirt and no shorts…, goes out all night and is late to the bus and very hung over the next day, spends all their money and then has to borrow cash off everyone else, has excess luggage charges or is a grumpy person who doesn’t want to participate with everyone else. However the majority of the people in each group was lots of fun, and they enthusiastically went along with all the organised activities and joined in with everyone else in the free time. Everyone thinks that the trips I did was like being on a paid holiday. However it most certainly was work. It was challenging trying to keep everyone happy. A group of very different people thrown together for a week living in close confines creates all sorts of issues. I would have to make sure that everyone was on time to the bus each morning, that everyone was dressed appropriately for the activities we were doing that day. Often that would be looking at a number of different hotels – which can be hard going when it is really hot and they insist on showing you about 20 different room configurations! Then in the evenings when we did have free time, trying to suggest things to do, and sorting out any problems that came along as well. Just next door to Thailand is Malaysia, we spent a couple of days on one trip in Kuala Lumpur which is a wonderful place. Visit the Batu Caves – climb the hundreds of steps to the caves at the top (watch out for the monkeys…) and the Sky Bar at the top of Traders Hotel is super cool and has a fabulous view of the Petronas Towers – once the tallest building in the world. I can’t wait to come back to Thailand and Malaysia on our yacht and spend lots more time cruising around this fantastic part of the world. And if you aren’t sailing – then Thailand is still a wonderful place to visit for a holiday or a longer adventure. That must have been an amazing job! We visited Thailand a couple of years ago and loved it. Seeing your pictures brings back great memories.